Manchester 13 ‹ Series 12 Reversions ‹ Flog It! Paul Martin is joined by Caroline Hawley and Micheal Baggott at Manchester's Museum of Science and Industry, which charts the city's role in the industrial revolution. Browse content similar to Manchester 13. Check below for episodes and series from the same categories and more! The city I'm in today has a long association with this - TV. It's home to the world's longest-running soap drama. ITV and dozens of other creative companies. The city with a massive reputation for media is, of course, Manchester. Manchester's media legacy is not just confined to the box. was formed by cotton merchant, John Edward Taylor. across the country, albeit with a slightly different name. at the doors of our "Flog It!" valuation day. later on in the programme at auction. She's lovely. We'll show your bust inside, sir. When you get in. -Bless you for coming out - not the best day in Manchester today. But everyone's turned out, isn't it lovely? Oh, yea! Oh, yea! Oh, yea! "Flog It!" is in town. And we better get the doors open to our fantastic venue today. of a treacherous loom, to the steam engines that powered it all. "Flog It! ", "Flog It! ", "Flog It! ", "Flog It! ", "Flog It!". That's what it's all about here today. so let's catch up with Caroline and see what she's found. -who really has brought something to shout about. -Yes, certainly. By all means. a little job at the Town Hall in Huddersfield for Age Concern. -for the most pieces of jewellery on the costume. And I got a message that this had been left. because of the provenance, and so I've brought it along today. And the provenance is what? -The provenance is that it belonged to Charlie Chaplin. So Charlie bought this for his wife? -For his wife at the time. -He was a bit of a lad, was Charlie. He was married three, four times, over the years. -So, he'd have to buy quite a bit of jewellery. It's around turn-of-the-century, so that would tie in. Sadly, it's not diamonds. It's paste. It's just silver plated on brass, you can see here. -there's more to this little brooch than meets the eye. so you've got the brooch and then these double as lapel badges. but then you see the big points in them. They'd make a hell of a mess of your ears! They've got big, sharp teeth to clip onto lapels. Which are really lovely, so you get three bits of jewellery for the price of one. -So he was a mean old Chaplin, wasn't he? this is her mother's jewel, given by her father, Charlie Chaplin. the jewel from Charlie Chaplin's daughter. £10, £20, that sort of thing. But with all this, I think it's going to get a premium. -So I would say...£40-£60. Are you happy with that? in Huddersfield, so it's all going towards that. That will be a noisy event? Oh, yes! 25 town criers, all their wives in their troop, crinoline dresses. Oh, and what's the collective term? -A cacophony of town criers. Cacophony of town criers, yes. -Yes, it'll be nice, I shall enjoy that. Thank you very much. and try to validate it. That's the great thing about selling at auction. but can you guess what's in this box? and bringing some jewellery with you. These aren't things you're tempted, either of you, to wear? Nicola used to wear the bracelet when she was a little girl. My mum used to give it to her to dress up in. You've got all the individual charms. and artistically, it's something we see a lot of. So really, that's its weight in gold in terms of value. -So that's worth about £100-£150. and the reason I grabbed you both, is the contents of the mystery box. -Shall we open the mystery box? grotesque pair of earrings I've ever seen in my life. -That's why we're trying to flog it. a branch of coral or something. But with a fly on it! You get bumblebees, you get dragonflies. You don't get flies on things. and from it you've got this little heart. that it's from around the Mediterranean area. -Have you got any family history with this? My grandmother is from Las Palmas, Gran Canaria. Perfect. A sort of Spanish feel, Mediterranean jewellery. Of course, the coral was supposed to protect you from evil. So you would wear them, bad things wouldn't happen to you. They're quite old. Have you any idea when they were made? I think they might be about 100 years old. Probably a little bit earlier than that. They're probably about 1860, 1880.
and a little heart missing. But sometimes things come along that are so quirky, you give them a go. £40-£80 and put a fixed reserve of £30 on them. Because that's the intrinsic value of the materials. We'll see, they might make 100 quid, they might make 30. We've got 100 to 150 for the bracelet and a fixed reserve of 100 on that. So, if we get the top end, what are the plans for the money? Buy more beads and make my own jewellery. -You make your own jewellery?! and make something new and beautiful with it. Marvellous, let's hope they do really well on the day. Love them or hate them, they are up for auction. Will anyone want to give these quirky earrings a new home? to the peaceful pastime of card playing and this lovely box. Tell me about it, Edna. I bought it at a car-boot sale about five years ago. £10! I love it. Do you? I do, I like it, it's just been on top of the piano in my dining room. -Play the odd game of snap. it's mounted with ivory cards on the top. It's a really, lovely, quality thing. This would have belonged to a fairly wealthy family. It's very, very good quality. It's lined in watermarked silk taffeta...at the top. Possibly would have been two other packs of cards there. -And I think in here there would have been counters. because the modern cards are rounded edges, aren't they? Now, it's all indicative of quality, taste. not least the bridge players, poker players. I would put a valuation on this of between £100 and £200. Good, that's a fair return on your £10 investment. I just like this inlay. -It's a good interior piece. -It's a very good interior piece. It has a serpentine top and a serpentine front. So it's quite stylish. So typical of the period. There's three experts here going, "Go on, go on, go on!" I just think it's very, very pretty. It's a nice piece. and you don't know what to do with it. There's a lot of detail there. There's an awful lot of detail. Manchester's musical history is unique. It spans genres and generations. that have swept right through the nation. But how can so much talent come from one place? And how is Manchester able to repeat that trick time and time again? Well, to find out, let's take it from the top. starts long before the rock and roll revolution. Thus becoming one of Britain's first professional symphony orchestras. almost every concert in the city. His orchestra still plays today to international acclaim. Perhaps Charles Halle was Manchester's first music legend. could be heard throughout Manchester well into the 20th century. that really upped the tempo of Manchester's musical heartbeat. and the American sounds of the day. and the sounds of black America. their own fashions and their own music. away from the constraints of the older generation. could listen to their favourite music all night long. but which is unmistakably Manchester and it's still going strong today. I'm being joined by Ivor Abadi, who opened the club in 1963. Something extraordinary happened in the '60s. after the war and they suddenly wanted a place to go to. I recognised that from five years earlier. -unbelievably it was successful from day one. -Tell me about the music. -but we wouldn't be playing too much of The Kinks. everybody wanted to hear blues, but it started to get into soul. -And that's when it really kicked off? -which you may have heard of. Sonny Boy Williamson, playing his harmonica. with all the American acts that we brought over, as well. that had a quick tempo and a heavy beat. The tracks went down a storm and a craze swept the nation. and the mood in the club. as in distinguishing between what was going on in London. really gravitated to this club. People came from all over the north-west and further afield. They came from Yorkshire. They even came from London, you know. -Sure, it was a big thing. -We had coaches coming from London. And it was... The atmosphere was theirs. It was a sort of social scene. A fantastic time. but everyone would have been once or twice. in Greater Manchester to dance the night away in. But the Swinging Sixties didn't last for ever. Manchester in the mid-1970s was suffering as a post-industrial city. Its glorious past was just a distant memory. the spirit in Manchester lived on with another flourish of music. one of the most successful record labels in British history. And here's the late Tony Wilson. And these cities have three years in the sun. For nearly 20 years, Manchester was THE music city in the world. These bands gave Manchester a sense of confidence and a new identity. to bang the drum of musical expression. Well, it's impossible to predict. and they want to hear the next big thing. but will the auction house confirm the provenance? so it's a sure-fire winner, but that can't be said of the earrings. or will the damage be a FLY in the ointment? And Edna's Victorian cardcase is adorned with ivory cards. it's legal to sell them at auction. But what profit will she see on her £10 car-boot investment? Tracey bought the 19th-century decanters for £700. you find the historic town of Knutsford. Fingers crossed we can make some history of our own. so we're in very safe hands. All I can say is, I wish I was wearing green as well. I've just been joined by Victor and our expert, Caroline, here. ..when I was doing my pieces to camera, and you were going, "ho-yea, ho-yea, ho-yea." -and the two collar clips. We thought there might be a connection with Charlie Chaplin? said her mother was married to Charlie Chaplin. -They've done a lot of research. She was apparently married to Aubrey Chaplin, who was Charlie's cousin. but we're not really going to play on that. -It hasn't affected the value, then? -No, no. It'll still stand alone. because it's going under the hammer now. Let's find out what the bidders think. The Art Deco paste brooch and matching collar clips. I can start the bidding on this at £40. Anybody got five? At £40 only. Is there five? At £40 I have. On commission at £40. Any advance? Quickly. I am selling it, anybody else interested? At £40 it goes to the maiden bid. -And there was no competition. Well, that's the advantage of auction research. but not the one that meant big money. It's my turn to be the expert and I've just been joined by Tracey. One's wrong, though, isn't it? -You haven't come by yourself, have you? -No, I've come with my daughter, Jessica. Start me now at four. Four where? Where's four? Who will start the bidding at £400? Yes or no at 400? Next, it's time to play our cards right. Sadly, we do not have Edna. She couldn't make it today. But we do have our gorgeous expert, Caroline, with us. Wants £200. -I think that's good value for money, don't you? It's got two packs of Reynolds cards. Reynolds was a great company making cards from 1809 to 1890. -They're quite valuable in their own right. Recently one has got about £60 for one pack of cards. So, I think two packs, plus the box, it's going to get the reserve. -because we should get the top end of the estimate plus a little bit more. Nice thing, this. I've got a bit of commission interest in this. I'm going to come straight in here at...£80. 80 I'm bid. Bid at £80. Any advance on £80? It's worth more, I'm sure. Come on. Bid it up. Thank you. 85 I've got. 90 against you. 110 I'm bid. At £110. At £110, the bid's in the room. Any more? At 110. 120. 130. Against you, sir. With me now. On commission against the room. The internet's out. It's £130. Well, it's gone. It's gone. Made estimate. You were right. -But it just goes to show, on the day, you can be quite lucky. You can get things at the lower end, rather than at the top end. I'm sure Edna will be pleased. -She wanted to sell it. She paid £10 for that. There's a cheque in the post for you, Edna. And next, that intriguing jewellery. I've just been joined by Maddie and Nicky and Michael, our expert. into two sales. The first lot, we're selling something that's hideous. Well, I tell you what, I don't think they're hideous. -That's the point. They are quirky. -I've never seen anything like them. And we've got a nine-carat gold bracelet, as well. -Which is more down to its bullion value. our first lot, these earrings. They're going under the hammer now. The cased pair of Victorian earrings. Start me where? At £50? 40. 30 online. You bidding against? I've got 30 here. Five. 35. 40. Speed up. You'll lose it. £40. 45. The phone's in now. 45. 50. Have I got 60? I've got £60. It's all online. 65. 70. It's climbing away. 110 now. At 110. 120. 130. 140. The phones are out. It's online. 150. Online at £150. Are we done? At 150, the bid's online. Nothing in the room? £150, hammer's gone down, crack. That's good, isn't it? And so to the charming bracelet. Nine-carat gold, flat, curb-link charm bracelet. I'm going to start the bidding straight in now at £100. 100, I'm bid. 110 against. 120 with me now. At 120. Come back at me. Still in? 120. -Working out the bullion price in the corner. 160 now. This commission's against you at 160. Are you coming back, try another? £160. With me now. Commissions have it. Internet's out. So, that's a good day out for you both, isn't it? Definitely. It was worth coming! She's already spent it around the corner. and you'll get a few beads for that! it's Michael, Jan and a plethora of pots. Jan, thank you for coming in today. Are there any vases left in your house, or do you have a vase fetish? but I'm trying to get rid of a lot cos I'm fed up of dusting everything. So are you a vase collector, or did these come through the family? No, they were left to me by my Auntie Maud. -that's the least interesting of the group. It's Italian - it's maiolica. So that's the thing that majolica was based on. and this white glaze put over it to make it look like porcelain. a little bit like ink into blotting paper. a chance it was 18th-century. and she thinks it's early-19th century in date. Let's say it's early-19th century. Did you, before coming to "Flog It!" hit it hard with a hammer? It's always been like that! That's a problem with it. But it's not dramatically valuable - £40-£60. -£40 reserve, see where it goes. -If two people think it's earlier, it might make over 100. These are pretty. Let's pick one of them up. We've got a matching pair and these are called cloisonne. very best ones always were signed. -You didn't hit these either? Erm, we've got a percussion crack there, where it's just pinged. And if we look at this one, we've got a little crack there, as well. But they're pretty and they're small and I love them. And a huge amount of work went into making them. but let's say they're worth £100-£200. -And put a fixed reserve of £100 on them. -Don't want any more dusting? If they do well, what are you going to do with the money? Well, let's get you a good pair, at least, possibly two. Thank you very much for bringing them in. engineering - big and small. Can you tell me about it, Steve? and it was on a chain. cos it was considered a special piece, really. so he was quite right to proudly wear it for Sunday best. And very dapper, I'm sure he looked in it. It's 18-carat gold, and it's an American movement - Waltham. Have you ever opened this up before and had a look inside? It's absolutely a precision work of engineering. which ties in with your father's dates. White enamel dial, altogether a very saleable item. so I think it's a very good time to sell it. I think we're going to put an estimate of £400-£600 on it. And if we put a fixed reserve of 400? I don't think we'll need it, I think it'll exceed that. -Be happy with that, yeah. Well, let's go and flog it. Michael is indulging his personal passion. Janet, thank you so much. when I swooped on your little spoon. Before I tell you anything about it, what do you know? The only thing I know about it is, it's just always been in the family. And when my mother died, 41 years ago, I just brought it home. Has it gone in the cutlery drawer? Have you stirred your tea and coffee with it? It's only a teaspoon, but it is very, very interesting. It's a piece of Arts and Crafts - British silver. so you've got all the hammer marks still showing. Very small hallmarks. We'll have a look. ..which, in itself, means nothing. But the maker's mark is SD. I've noticed that, but I've looked on the internet and I couldn't find SD. Arts and Crafts female goldsmith. there's very much more jewellery by her than there is silver. it would be worth its weight in silver of £5. But it's changed it from £5 to £50. -And we would put it into auction at £50-£100. -And we'd put a fixed reserve of say, £40, on it. only the tenth piece of silver I've ever seen by her. It's made my day, made my year, Janet! -I'm glad I brought it! -I'm delighted. Thank you so much. Caroline has found her last item of the day. Tell me, what do you know about these? I didn't know anything about them. I bought them from an antiques fair. Probably paid about £20 for them, something like that. I saw them in a book and the book explained what they were. And they are supposed to be burial mirrors to ward away evil spirits. That's really all I know about them, really. and find out a little more about them. That is exactly right, they are late 18th-century Chinese. And they would have been beautifully polished, on the back here. to ward off evil spirits in the afterlife. But they were also worn in life. If you look closely, this fabulous working in here. would be to thread silk through and it would be worn on your garment. and it would ward off evil spirits in life, in the here and now. and there is a lot of interest in oriental things at the moment. -So people collect this sort of thing? -Yes, people will collect them. -Now, you have obviously enjoyed these all these years. -Have they been in a display case or something? -There is probably a little bit of ash in there still. -It's too good for an ashtray. -I know, but we didn't know, then. We see quite a few of them. They are not uncommon. on the detail, the quality and the size, to a lesser or greater extent. These, I would think, are worth £200-£300 for the two. -It is. It is. And you paid what, £20? -It would be nice if they were worth £1,000 each! If we put a reserve of £200, are you happy with that? -Yes, I am, that's fine. if they are magic when we take them to auction. Manchester's Museum Of Science And Industry. in Knutsford, and here's what's coming with us. but the damage has led to a low valuation. Could he have got it wrong? Keep watching for a jaw-dropping auction. Will it be a wind-up for Steve and his gentleman's pocket watch? A classic Arts and Crafts design, but from a unique maker. Caroline has valued these Chinese mirrors at £200-£300. Will the auction house agree? And now for my favourite part of the show. Let's head straight to the auction. pocket watch belonging to Steven, and it is quality, isn't it? -18-carat, Dennison case - it's a lovely piece. Let's hope we get the top end of the estimate. Let's put it under the hammer now. We need top money for this. Edward VII, 18-carat gold Waltham pocket watch. And I can start the bidding on this one at £400. Someone else is joining the party here in the room. You're out left at 720. That was worth doing, wasn't it? Stylish, useful and solid gold - no wonder it smashed the estimate. Next under the hammer, the tiny teaspoon. You loved that. You instantly recognised the initials. and that is translated in a little teaspoon. So somebody's buying something quite precious. Where are we going to be for this one then? £40 and start me... 40? 25 I have. At £25. You're out in the room, and I'm selling now at 40. -The thing is, it's very...academic. We didn't have two people that wanted it, we had one person online. But we protected it with a reserve, and that's what it's for. -It was so tiny. Very tiny. -Thank you for coming in. but hopefully you have, as well. that says history and money! we have got those two lovely Chinese bronze mirrors. Well, we thought they were Chinese, but they are Japanese. After a bit more research. Yes, late 19th-century, early 20th-century copies. -I thought they were Chinese. Copied, copied from the original Chinese earlier ones. So they have got the same symbols, they are just a century later. But I think they will still sell. Yes, and I had a chat to Nick, the auctioneer, yesterday. And he said actually the value is spot on. It won't affect the value. -But we are still in with the money, there. Good luck. Fingers crossed. Let's find out what they are worth. Here we go. Nice quality, nicely cast, good bit of patination. 19th-century Japanese mirrors. Where are we going to go? £200 for them? £200? 150? 100? Come on, who is in? 100 I have, thank you. 100 I am bid. -Straight in and out. That was quick. -110 I have got, then. 120. 130. 140. Nothing online? I have got 140, 150 online. 160, 160 I am bid. -At 160 now. At 160. Any advance on 170? I think that's all. 190, the bid is online. I am selling at 190. Make no mistake, the hammer is going down. That was close, wasn't it? Oh, the things you do to get on TV! Nick Hall used his auctioneer's discretion to let them go at £190. And now, finally, those striking, but damaged vases. -You're looking very smart today. You're off shopping after this, aren't you? -Could be. Depends how much we make. -Dressed to kill - dressed to go shopping! What's top of the list, what are you looking for today? -I knew it! I knew it! I don't know if we can pay for a good pair of shoes with it. Heels to go on maybe! We're looking at £100-£200 with the two cloisonne vases. Pair of Japanese cloisonne vases. Good lot this one, we're going to open the bidding. £100 and start me quickly now. 95, I'm bid. At 95 in the room. And 10 on the phone. At 130 bid. And 40. 60. 170 on the phone. This is good, getting the top end. 60. 270 if you like. 280. At 280. 90 now? Shakes his head on the phone. It's 280 and it's on the internet. and I'm selling at 280. Hammer's gone down - £280. A great result for the cloisonne vases. Next, Jan's majolica. Will it go the same way? Nick Hall takes to the rostrum for the last time. The 19th-century Italian maiolica vase. Nice thing, this, good early look about it. Start me where? Not a lot of money at £40. 30? 20? It's got a wonderful look. Let's get the ball rolling now. 45. At 45 I've got. And 50 I've got. And 5 I've got. And 60. 65 - it's all climbing online. At £70 we're back on the phone. Thank goodness for the internet, it eluded the people of Knutsford. I've got 100 and 120. You coming back in now? -You've got your shoes already. 210 now. The bid's on the phone at 210. Against you - Italy. 220. I think two people are convinced it's early. 360 now. 360 I'm bid. Any advance on 5? 520. You might be buying a shoe shop, you realise this, don't you?! It was a come and buy me, Michael. It was a run and buy me, wasn't it? I'll buy you two a pair of shoes now. That's a complete outfit now - handbag and shoes. They're bidding in Italy, they're bidding on the phone. Fresh phone bidder - he's in at 980! Take a 50 with you. Thank you - 1,050. I did have a feeling on the day it was early. I said to you! I said, "I think this is early." At 12 now. I've got 12 with Niall. This is a great auction. This is what auctions are all about. Congratulations to you lot, by the way! That is what a good auction is all about, isn't it? that's for sure. We just don't have time! We've all had a brilliant time in Knutsford. 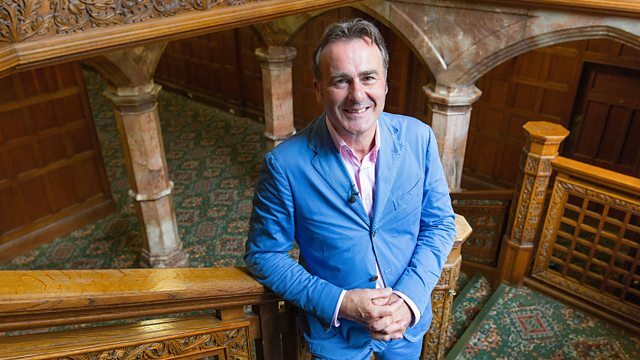 See you next time for plenty more surprises from "Flog It!". This episode comes from Manchester's Museum of Science and Industry, which charts the history of the city's role in the industrial revolution. Antiques experts Caroline Hawley and Micheal Baggott search the queue for the best antiques and collectables to take to auction. Paul Martin takes a journey through Manchester's musical history from the Halle Orchestra to the Happy Mondays, explores the forgotten world of Manchester film and has a read of the first edition of the Guardian newspaper, where the headline news is rather surprising.